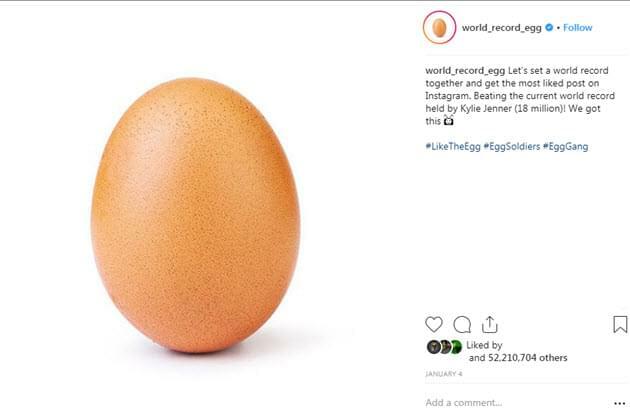 Remember the Instagram @World_Record_Egg, whose entire purpose was to get a picture of a simple egg to be the most liked picture on Instagram, breaking Kylie Jenner’s record picture of her daughter, Stormi? It achieved it’s goal! As of this post, it has 52,213,917 likes! It was the weird type of social media content the internet loves, so it worked! And was talked about in pop culture ALL OVER THE PLACE! And wait a second… Hulu is involved? If you don’t have Hulu, or you don’t want to log in to watch a 1 minute video, no worries… they posted it on Insta this morning. THE WHOLE THING was a viral marketing campaign aimed at mental health awareness! I. LOVE. THIS! Social Media has been shown to actually cause depression… because everyone puts only their best lives on social media, not their down moments. And those that DO post their down moments tend to get told to keep it to themselves, not to “air their dirty laundry” on social media, or in other ways punished. So then why BE real? Only the good is celebrated, and likes = reinforcement, so we only post the good stuff, making us, AND everyone else around us, feel like our life doesn’t measure up! Social media GREAT, but it is also a detriment to society! So I love that in a viral post and a one-minute video teamed up with Hulu, this egg is shedding light on mental health! Also as someone who struggles with depression and anxiety myself, I love this! Within the last couple years, I’ve tried to be up front about it. If I hide, then it feels like something worth hiding, something that makes me not as good as others. If I show it, I hope to show others it’s possible to live with these frustrating illnesses and still not only survive, but thrive! On Twitter I try to be very open about days that I’m struggling, and that I go to therapy… and I HATE when a celebrity loses their battle with depression, the internet is flooded with “PLEASE reach out to me if you’re struggling,” because it shows an inherent lack of knowledge on depression (hint: if we’re really struggling, we usually think we’re a bother to friends and family, so we absolutely will NOT reach out to you). I have a unique position in that you may know a bit about me, but unless we’ve interacted at places I’ve been broadcasting, at concerts, or online, I don’t know enough about you to reach out if I think you’re struggling, so I ask this: PLEASE connect with me on social media- I’m on Twitter the most, but find me on Instagram, too. I want to know you so we can openly talk about depression, and hopefully this dialogue makes it better! Ask me literally anything about my depression, I’ll be 100% honest with you. There are still things I haven’t been able to bring myself to talk about publicly about my past, but in dialogue I’m getting better at revealing it… and I’ve found strength in talking about it. I’ve found that talking to others about their mental health and their journey to a better mental state has helped me, so I want to pay that forward! If you listen to our station, or even if you don’t, I love you. You’re a human being who deserves compassion and empathy, and I have a lot of that to give… almost to a fault! Anyway, who knew an egg could bring us all closer together? I heart you, world_record_egg!